On two nights in late January, the Harker Conservatory presented Dancing Through Life: Celebrating the Past and Looking to the Future. This year’s upper school dance production honored the past and present, showcasing classic hits and contemporary favorites while participants look towards futures as dancers and performing artists. Both performances were held at the Blackford Theater. The 86 cast members worked very hard to produce a beautiful, lively show. The evening, like the event’s name suggests, was split into two parts, with “Celebrating the Past” performances before intermission and “Looking to the Future” performances after it. In early December, The Harker School’s lower school music students gathered for their annual concert. The concert featured five groups total: the choir, orchestra, jazz band and two preparatory ensembles. Technically, practice for the concert began on the first day of class. Class and practice are one and the same, and the concert allows students to showcase the broad range of styles they’ve learned by singing and playing various pieces. Closer to the concert date, students selected what they wanted to play. The wonderfully varied program was capped off by a unique, energetic song choice. As the finale for the event, the students chose the theme song to the popular game Angry Birds. The students wore Angry Birds hats, and the piece was conducted with a slingshot. In mid-January, The Harker School had its 2012 Winter Concert at the Mexican Heritage Theater in San Jose. The show featured the middle school orchestras and jazz band for the first part of the evening, with the upper school orchestra and jazz band following right after. Middle school wind and string ensembles started the evening. The Grade 6 Orchestra took the stage next, and they were followed by the chamber ensemble performances. Then it was grades 7 and 8 students’ turn to shine, which they certainly did through various jazz band pieces as well as through the orchestra’s three selections. The upper school started off their portion of the evening with their jazz band, and after a short intermission, the upper school orchestra took the stage. They closed out an enjoyable evening with four pieces. At the end of January, the upper school Conservatory had its annual WinterSong concert. This performance features Bel Canto, a group known for the many musical genres it explores. Several of these were featured at the show, including musical theater, pop and classical, the last of which was particularly rich this year due to two special guests: Cantilena, Harker’s “all-classical-all-the-time” women’s ensemble and Camerata, a mixed classical, choral chamber ensemble, who perform essential works in various languages. Each group performed one piece at WinterSong this year. In addition to collaborating with soloists, Bel Canto also joined forces with a few talented instrumentalists. This year’s event, which was overseen by Jennifer Cowgill, Bel Canto’s director, included students from every upper school grade level. The musical starts in an “Average Family Kitchen” and takes the audience through the beginning of the day (a scene featuring a song called “I’m in a Daze”) and then through a variety of classes, such as history, English, math, P.E. and choir. Each of the song and dance performances accompanying the scenes had its own unique spin on an aspect of a school day, with song titles such as “I Love My Locker” and “Cafeteria Confusion.” One of the big highlights of the play – which proved to be a delight throughout – was that the students portrayed Harker teachers in any scene a teacher was called for. There were three showings of the musical, including a special performance for the rest of the lower school. 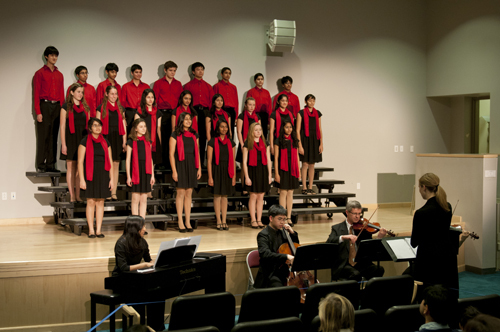 Downbeat, the upper school’s show choir, brought holiday cheer to the Bay Area in December. They were featured performers at the holiday boutique at Filoli Gardens and gathered an impressive crowd beneath the giant Christmas tree at Pier 39. They also caroled through the halls of the Lucile Packard Children’s Hospital children’s oncology ward and sang for both independent seniors and those in assisted living at The Forum in Los Altos. The group closed the evening with a show in the lounge of the San Jose Fairmont Hotel, with family, friends, teachers and administrators cheering them on. Instrumental talent on display included several violinists, a cellist and a guitarist. Among the many vocal performers onstage during the evening was a duet from a pair of 2011 graduates, followed by many other soloists, including more of the recent ’11 grads as well as graduates from 2007. One solo performance featured dance accompaniment while others were performed in foreign languages, including a stunning piece in French. Soloists weren’t the only ones to get in on the act, though. A large group of former Cantilena singers from many different graduating classes took the stage that evening, and Guys’ Gig alumni closed the show with arranged versions of popular songs. In January, three seniors made their directorial debuts at this year’s Student-Directed Showcase. Each chose a play to direct and produce, learning a great deal in the process. The students also had the opportunity to march in the London New Year’s Day parade, carrying the flags of the countries participating in this year’s summer Olympic games, which will take place in London. Laughter rang through Saratoga and Blackford campuses in early February when Harker was visited by Baby Wants Candy, a musical comedy improvisational troupe who led workshops and performed at a sold-out event. Baby Wants Candy has permanent troupes in New York and Chicago; at any given time they may have 40-50 performers in groups that tour, including to the Edinburgh Festival Fringe, where their relationship with Harker began. The troupe performed at an upper school assembly on Feb. 3 and spent both lunchtimes answering questions from Conservatory students at a “Life in the Arts” workshop. On Friday and Saturday afternoons, Harker students were put through their improv paces in five hours of workshops. They spent Friday breaking down the elements of improv and listening to a fabulous primer on this difficult art form. Saturday they were joined by more of the cast, and the lessons continued, eventually preparing the students for participation in the BWC show on Saturday night. The first half of the show allowed the Harker workshop students to spread their improv wings and test out all they had learned in the past days. BWC cast members led the students through all manner of improv games, all based on suggestions from the audience. Then the BWC cast performed. An audience member suggested the title “Presidents on Jeopardy,” and a fully choreographed, plotted and staged musical unfolded, replete with topical political references, hilarious rhymes, and the Jeopardy theme song woven throughout several of the musical numbers.